1995 Education Program / Melbourne Symphony. Contents note: Grathawai: Movement III (excerpt) / Anne Boyd -- Nutcracker suite: March / Tchaikovsky -- Thunder and lightning polka / J. Strauss Jr. -- Hungarian dance No.5 / Brahms -- William Tell Overture: Finale / Rossini -- Atmospheres (excerpt) / Ligeti -- Music for the Royal fireworks: La rejouissance / Handel -- The three-cornered hat: Miller's dance (excerpt) / Falla -- Gayaneh: Sabre dance / Khatchaturian -- Romeo and Juliet: Montagues and Capulets / Prokofiev -- The red poppy: Russuan sailor's dance / Gliere -- Gymnopedie No.1 / Satie -- Billy the kid: Gun battle / Copland -- Celebrare celeberrime / Carl Vine -- Interview with Anne Boyd -- Interview with Carl Vine. 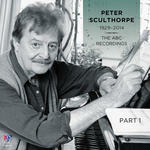 CD to accompany MSO Education Program's Kindergarten to Year 8 resource kit. Capture session: Boyd recorded ABC, September 1993 ; Vine recorded live by ABC at Sidney Myer Music Bowl, Melbourne, February 1995. Performers: Adelaide Symphony Orchestra (Boyd) ; Janos Furst (conductor: Boyd) ; Melbourne Symphony Orchestra (Vine) ; Paolo Olmi (conductor: Vine). CD: Sydney Symphony Orchestra education program 1994 K-8 resource kit : Edo de Waart chief conductor & artistic director. 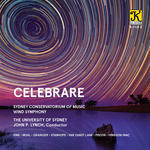 CD: Celebrare / Sydney Conservatorium of Music Wind Symphony.